Of course it’s a gimmick, but it is so cool. It’s also great to see the look on your guests face when they bite into one of these expecting a good old egg and then doing a double take. Their brain is telling them that this is an egg but the signals they are getting from their taste buds are totally wrong. It really is fun. Making one food that so looks like another has been done for centuries. Supposedly the British monarchs were very fond of “meat fruit” where meat, usually forcemeat or liver parfait, is formed and made to look like fruit (cherries, mandarins…). These “meat fruits” are a main feature in Heston Blumenthal’s new restaurant, Dinner. Click here to see a nice blog post about one of the recipes. 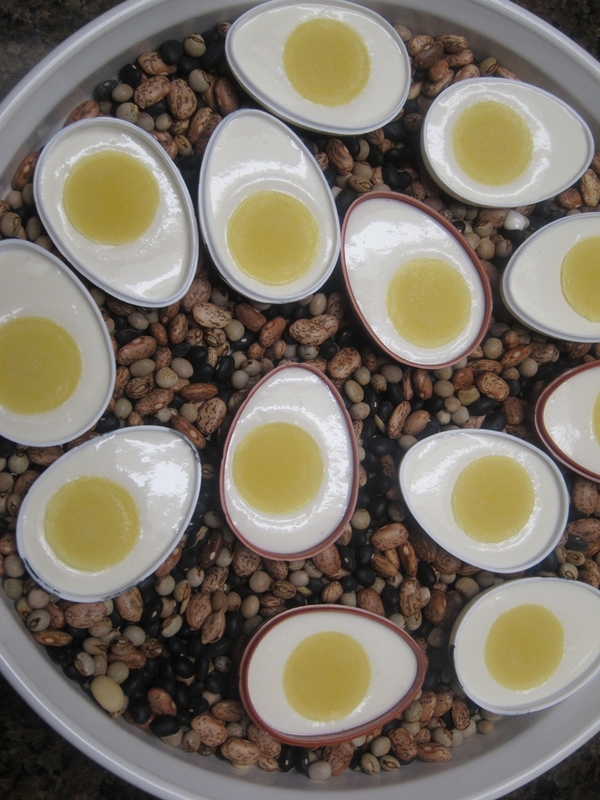 As for the Virtual Egg in this post, well I made several of them to use in a dish that I will post about shortly. First and foremost, I knew that the flavors and colors would work great with my dish and this particular recipe has been on my to-do list for a long time. Since I got Michel Richard’s “Happy in The Kitchen” years ago, the Virtual Egg that he uses to garnish a tuna dish caught my eye. Partly due to laziness, and partly because I did not want to buy egg-shaped molds I never got around to it, until Easter came around this year. That’s when I noticed that the eggs my kids got where perfect for the job. They are cut vertically as opposed to the cheap ones that are sliced through the equator. So, I confiscated them (I still let them eat most of the candy), washed them well and added them to my collection of molds. To make the egg yolks, I used yellow tomatoes. The tomatoes are peeled, seeded and cooked down with some cream. They are then pureed and seasoned with salt and a small amount of mustard. Gelatin is added to them and they are allowed to set in hemispheric ice molds in the freezer. These can then be unmolded and stored until ready to be used. The white is made from fresh mozzarella cheese, milk and gelatin. This mixture gets poured into the egg shaped mold and a “yolk” is placed in the center. Since my makeshift egg molds are not designed to lay evenly on their side, I put them in a pan filled with dried beans to keep them straight. The whole thing gets to set in the freezer until fully solid. I then unmolded the eggs and stored them in FoodSaver bags. One downside to using these “molds” is that if you look carefully you can see the circle indent that’s on the inside of the molds imprinted on the eggs. Once quartered and served properly it does not matter though. Since I had more than I needed for my dish, we ate a few plain and some served on top of a simple salad. The taste is delicious and familiar, but in a very unexpected form. HAHAHAHAHAHAH. Ha. Ha. Remind me not to eat at your house. I’m totally going to try this on my friends. awesome! 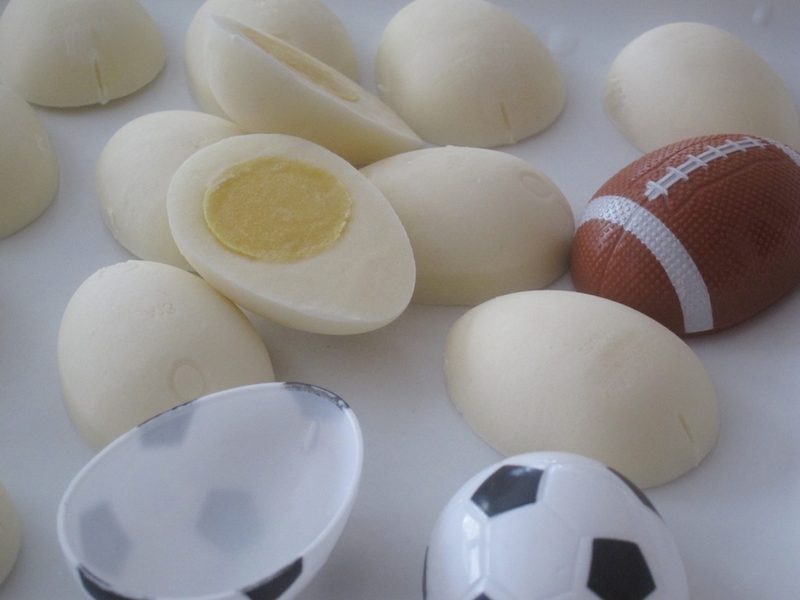 insanely creative use of eater egg “shells”!!! !